A couple of months back I was going through some articles on Mount Everest in Wikipedia, and I came across the 1996 Everest Disaster. Instantly hooked on to the topic, I read hundreds of articles and newspaper reports on the whole story. I also read Jon Krakauer’s Into Thin Air. It is a first-hand account of the event as Jon Krakauer, the author, on assignment from Outside magazine, was in one of the affected parties. National Geographic magazine has ranked this book 9th on their list of 100 greatest adventure books of all times. The disaster gained wide publicity. The tragic deaths of world-renowned guides Rob Hall and Scott Fischer are by now well documented in hundreds of articles and in many books, yet, when I spoke to my colleagues and friends, none of them seemed to have heard or known anything about this. So I decided to run the story here on my blog; a story of bone-chilling horror and of heartbreaking heroism. Note: I have borrowed paragraphs and sentences from various sources, most notably, Wikipedia and National Geographic magazine to bring out a comprehensive article on the incident. Since the first ascent of Mt Everest in 1953 by Sir Edmund Hillary and Tenzing Norgay Sherpa, at least 300 people have died on the slopes. On the night of May 10, the great mountain once again showed its hunger for human life. A sudden storm swept the peak’s fearsome “Death Zone” with snow, subzero cold and hurricane-force winds while more than 30 climbers were descending from the summit. All were in what climbers call the Death Zone, above 7,500 m where the air lacks oxygen enough to support life for long periods. Within 24 hours eight had died and three others had suffered severe frostbite. That spring there were more climbers on the south side of Mount Everest than ever before. Shortly after midnight on May 10, 1996, three teams; Adventure Consultants, Mountain Madness, as well as an expedition sponsored by the government of Taiwan – a massive throng of 33 climbers began their summit attempt. At the same time, an expedition by the Indo-Tibetan Border Police, led by Commandant Mohinder Singh started their ascent from the North side of the mountain. 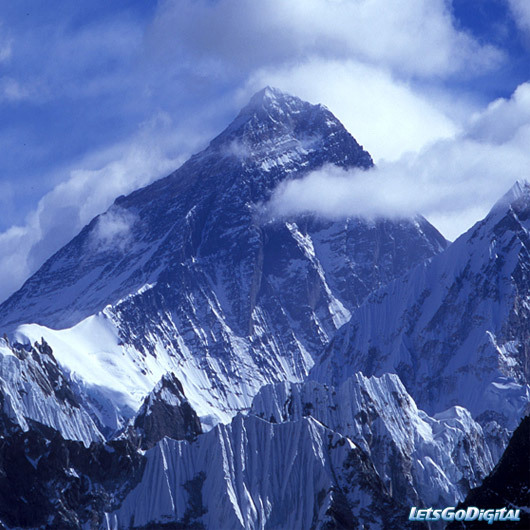 The expedition was credited as being the first Indian ascent of Everest from the North side. Subedar Tsewang Samanla, Lance Naik Dorje Morup, and Head Constable Tsewang Paljor were part of a six-man summit attempt from the North Side. Being a traditional type of expedition, the summit team did not have any Sherpas to guide them in their ascent. The team was the first team of the season to go up the North Face. It would be their responsibility to fix the ropes during ascent and break the trail to the top, a task that has its own share of difficulties. On the south side, the expeditions quickly encountered delays. At the Balcony, a broad shoulder like area (8350 m/27395 ft), the failure of the climbing Sherpas or guides to set the fixed ropes by the time the team reached that point cost the team almost an hour. Upon reaching the Hillary Step, the climbers again discovered that no fixed line had been placed, and they were forced to wait for an hour while the guides installed the ropes. Despite difficulties, the assault seemed to be going well for those who continued. They moved up steadily, and by 1:30 p.m. the first climbers reached the summit. They stood in weary triumph on the small patch of ice and snow that at 8,848 m is the highest point on the earth. But many of the climbers had not yet reached the summit by 2:00 pm, the last safe time to turn around to reach Camp IV before nightfall. 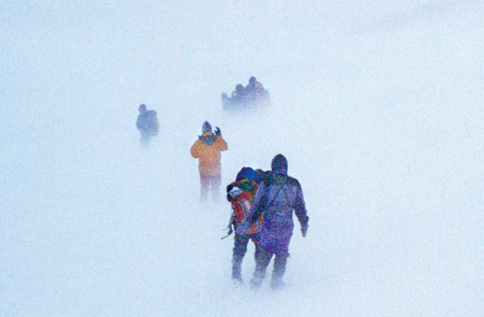 In the North side, the Indian team was caught in the blizzard above Camp IV. While three of the six members turned down, Samanla, Paljor and Morup decided to go for the summit. Samanla was an accomplished mountaineer who had summitted Everest in 1984 and Kanchenjunga in 1991. At around 6:00 pm the three climbers radioed to their expedition leader that they had arrived at the summit. Team leader, Commander Mohinder Singh, in turn conveyed the glad tidings to (then) Indian Prime Minister P.V. Narasimha Rao, causing rejoicing in India. While the Indian camp was jubilant in their celebrations, some of the other mountaineers at base camp expressed their reservations about the timing, which was quite late in the day to be on the summit. The three climbers left an offering of prayer flags, katas and pitons. The leader, Samanla, decided to spend extra time for religious ceremonies and instructed the other two to move down. There was no radio contact after that. Back at the camps below, anxious team members saw two headlamps moving slightly above the second step – at 8570 meters. Over to the south side, Scott Fischer, leader of Mountain Madness expedition, and Macalu Gau, leader of the Taiwanese expedition were unable to descend below the Balcony in the storm. Fischer collapsed an hour above camp, his climbing sirdar, Lopsang stayed with him as long as he could, and later said he was prepared to die with his friend. Fischer threatened to jump if Lopsang, who had been climbing without oxygen, did not descend. Hoping to send back help, Lopsang finally agreed and left Fischer on a protected ledge. Soon Rob Hall, leader of Adventure Consultants expedition, radioed saying that Doug Hansen, his American client had fallen unconscious, but was still alive. Doug Hanson was an American Post Office clerk, with 22 years’ climbing experience, he had mortgaged himself up to the hilt to pay for his Everest dream. Doug Hansen was the last one to summit on the day. Hall had offered to remain with Hansen while sending his other guides to help the descending clients. Hall’s colleagues pleaded to abandon Hansen, a hopeless case, and descend, but, Hall insisted on remaining with the stricken man, knowing that at nearly 29,000 feet neither of them could survive long. Adventure Consultants guide Andy Harris began climbing to the Summit at 5:30 pm with supplementary oxygen and water to help Hall. Hall and Fisher were world-renowned guides. 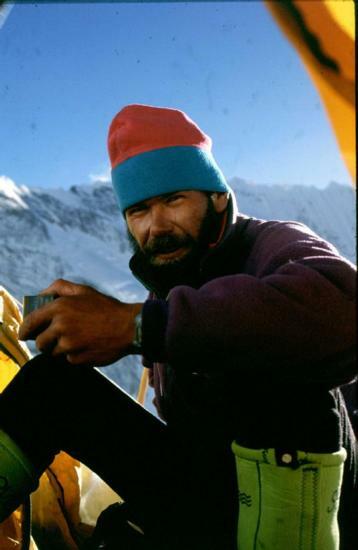 Until 1996, Hall had ascended Everest more times than any other non-Sherpa mountaineer. Fischer was the first American to climb Lhotse, the world’s fourth highest peak. This was Fischer’s fifth trek to Everest. Several climbers from both Adventure Consultants and Mountain Madness expedition became lost on the South Col. They wandered in the blizzard until midnight. When they could no longer walk, they huddled some 20 m from a dropoff of the Kangshung Face. Near midnight, the blizzard cleared enough for the team to see Camp IV, some 200 m away. Anatoli Boukreev, a guide in the Mountain Madness team lead by Scott Fisher, located the climbers and brought three climbers to safety. But Yasuko Namba, a Japanese women at 47, who had just set the record that day as the oldest women to have reached the summit (her record was later beaten by Anna Czerwińska of Poland who summitted Everest at age 50), and a Texas physician by name Beck Weathers were left in the cold because Boukreev thought they were beyond any chance of survival. Having made two forays to rescue these climbers, Boukreev, in common with all other climbers then at Camp IV, was exhausted. Neither Boukreev nor any of the other climbers at Camp IV felt able to make another attempt to reach Namba. On May 11, at 4:43 am, Hall radioed down and said that he was on the South Summit. He reported that Hansen, who had been with him since the previous afternoon, was now ‘gone’. In addition, he said that Harris, his second guide was missing as well. Hall was not breathing bottled oxygen because his regulator was too choked with ice. “Sleep well my sweetheart. Please don’t worry too much”. These would be the last words anyone would hear him utter. Two Sherpas returned to Beck and Namba’s position to check up on them. After chipping blocks of ice off of their faces, the Sherpas found both of them to be breathing, but severely frostbitten and “as close to death as a human being can be”. The call once again was made to leave them for dead, since there was little that could have been done to save them even if they were able to drag the bodies back to camp (no small feat when you’re 29,000 feet into the troposphere). 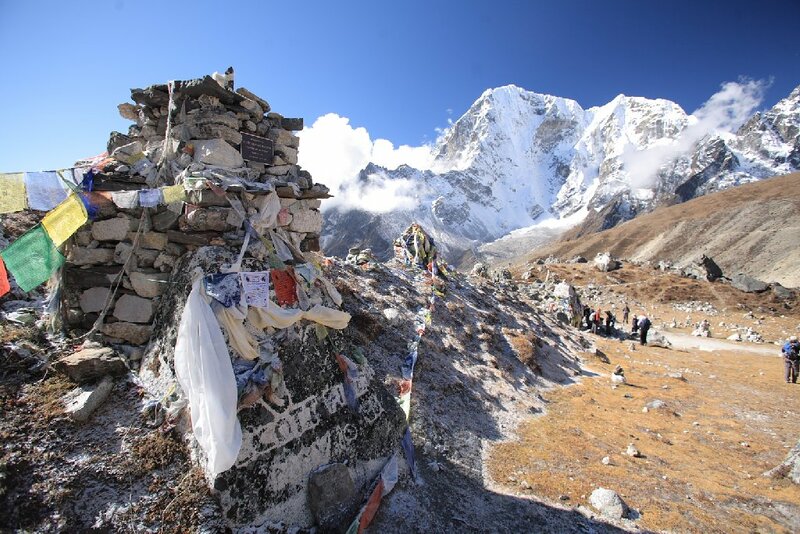 The Sherpas slogged back to camp and reported Weathers and Namba’s deaths. But then something incredible happened. 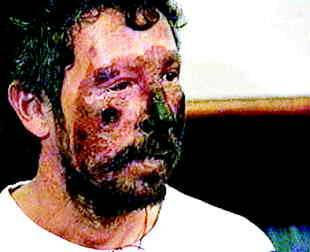 Beck Weathers opened his eyes. His entire body was numb, and he was stupid from altitude sickness. Despite all his deficiencies, he was able to stumble three hundred yards into the searing cold wind in an incredible feat of endurance. Finally, against all odds and to the shock of everyone who witnessed it, Beck Weathers lurched into Camp IV. “I was lying on my back in the ice. It was colder than anything you can believe. I figured I had three or four hours left to live, so I started walking. All I knew was, as long as my legs would run, and I could stand up, I was going to move toward that camp, and if I fell down, I was going to get up. And if I fell down again, I was going to get up, and I was going to keep moving until I either hit that camp, I couldn’t get up at all, or I walked off the face of that mountain”. “People were crying. I heard someone yell, ‘Don’t let me die here!’ It was obvious that it was now or never. I tried to get Yasuko on her feet. She grabbed my arm, but she was too weak to get up past her knees. I started walking and dragged her for a step or two. Then her grip loosened and she fell away. I had to keep going”. Earlier in the day, climbing Sherpas located Fischer and Gau, but Fischer’s condition had deteriorated so much that they were only able to give palliative care before rescuing Gau. Boukreev made a subsequent rescue attempt but found Fischer’s frozen body at around 7 pm. Over to the north side, none of the three Indian climbers had come back to high camp at 8320 meters. A Japanese expedition which departed from Camp 6 (8,300 m) for the summit attempt despite the harsh weather (on May 11) allegedly encountered the three Indian climbers. In Krakauer’s account, the lone climber, (whom Krakauer believes to be Paljor) was still moaning and frostbitten from exposure over the night. The Japanese climbers ignored him and set out for the summit. After they climbed the second step, they ran into the other two climbers, probably Samanla and Morup. Krakauer notes “No words were passed, No water, food or oxygen exchanged hands. The Japanese moved on …”. There is also a dispute whether the three had actually reached the summit. Krakauer claims in his book, that the climbers were at 28,550 feet, roughly 500 feet short of the topmost point. This is based on the interview given by the Japanese team to Richard Cowpens of the London Financial Express. 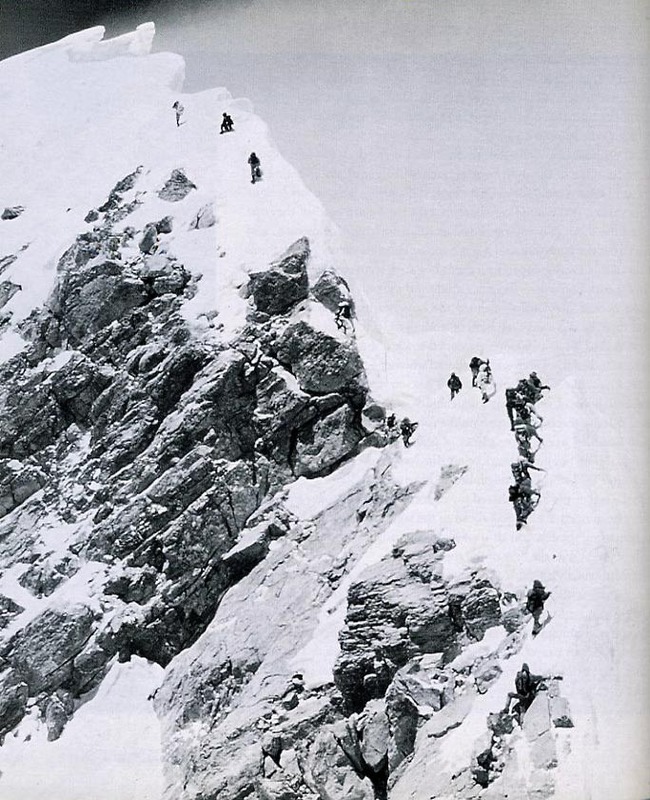 Due to bad visibility and thick clouds which obscured the summit, the climbers believed they had reached the top. This also explained why the climbers did not run into the teams that summitted from the South Side. In the South Side – Camp 4, Beck Weather’s fellow climbers did not expect him to survive the night. With that assumption, they only tried to make him comfortable until he died. He lay alone in the tent unable to drink, eat, or keep himself covered with the sleeping bags he was provided. His cries for help could not be heard above the blizzard. Later in the night colleagues attempted to make radio contact with Rob Hall, but went unanswered. Twelve days later, when the IMAX team climbed over the South Summit on their way to the top, they found Hall lying on his right side in a shallow ice-hollow, his upper body buried beneath a drift of snow. Rob and Jan’s farewell exchange has become part of Everest legend. Rob Hall, in the best spirit of his craft, tried to get his American client down. By then it became too late for him to save himself. Beck Weathers had survived another freezing night. His companions were surprised to find him alive and coherent on May 12. Eventually, Beck Weathers, along with Macalu Gau were helped down the mountain by climbers Ed Viesturs and David Breashears of the IMAX crew. Ed Viesturs is one of the world’s premier high-altitude mountaineers. He has appeared as himself in a guest role in the movie Vertical Limits. David Breashears is an American mountaineer and filmmaker. He is famous for guiding Richard Bass to the summit of Everest, thus completing Bass’s ascent of the Seven Summits. David Breashears was filming for his IMAX film Everest with Ed Viesturs when the storm broke out. Everest went on to become one of the highest grossing IMAX films of all times. Beck Weathers, along with Macalu Gau were airlifted to safety from a flat spot near Camp II in what is certainly the most dramatic helicopter rescue in Everest history – a heroic effort by Nepalese Army helicopter pilot Madan K.C., who twice flew to above 21,000 feet to retrieve the two men. Journalist Jon Krakauer related his experience in his bestseller, Into Thin Air. Anatoli Boukreev, who felt impugned by Krakauer’s book, co-authored a rebuttal book called The Climb. Beck Weathers and Lene Gammelgaard, a client in Hall’s team, wrote about their experiences of the disaster in their respective books, Left For Dead and Climbing High. The storm’s impact on climbers on the mountain’s other side, the North Ridge, where the Indian climbers died, was detailed in a first-hand account by British filmmaker and writer Matt Dickinson in his book The Death Zone, later republished as The Other Side of Everest. Guide Rob Hall ran an ad boasting of a “100 percent success rate” in one of the magazines to attract customers. One evening in late April Rob Hall told Jon Krakauer, “With so many incompetent people on the mountain, I think it’s pretty unlikely that we’ll get through this without something bad happening.” Krakauer in his book also says that Rob Hall was more worried about having to save other ‘incompetent people’ if disaster is to strike. Little did he know that it would be his team that would be in the center of the whole disaster and he himself would not survive. P.S: Please leave your comments if you find this post informative and useful. Thank You. Thank you for giving us this – it answers what many could not and that it was a terrible cost to how savage Everest still is. Thanks for dropping by. Some may think climbing Everest is a easy job if you are physically fit. But Everest asks for much more than physical fitness, and that’s why so many people die on the slopes of this savage mountain every year. Your narration is simply impeccable. Will love to read other posts of your blog too. Thanks for reading Nalini. Your comment has warmed me. I appreciate your great work for taking time to know and detail about the himalayan disaster. Good Job… Thanks for sharing with us.. Try submitting your posts in http://www.indli.com to share this valuable piece of information to many viewers. Thanks Deeptha. I will submit this post in indli as you advised. Thank You Richa for reading this post. Yes I have read a lot about Green Boots. Green Boots is refered to the body of Tsewang Paljor, one of the three Indian climbers who died on the same day (May 10 1996). I have mentioned about them in this post. Read Jon Krakauer’s Into Thin Air, a wonderful book. If you are interested in Everest stories, nothing can be better than this book. Man I am just reading the book Into Thin Air for my Reader’s Workshop and the book is just amazing and this article is also very informative and helped me do my project. Good to hear something like this. Thanks man. I am doing MBA and as part of my curriculum, we did watch the movie and read the article about it. Its been 1 year and I only remember the names of the characters and vague details of the incident, but what I still have remembered that it was due to lack of preparation that caused the disaster. As such Mt Everest is very complex and unpredictable, but due to the greed and pride of not admitting defeat, one of the guys (prob Rob Fischer) continued with the expedition, even though he was more than exhausted and certain things weren’t properly managed at the start of teh trip at the base camp. BTW, I liked your blog and your sense of humour, esp the posts of Bangalore and recession. You can read my post and re-live the entire incident. I’m not trying to market myself, but it is a fact that nowhere else in the internet you will get to see a more comprehensive coverage of the story than what you get in this post. Thanks for you appreciation, Yogesh. I will read your post. Yogeshwar -“Rob Fischer” hmm , for a person doing their MBA you should at least get names correct,, the leader of Mountain Madness was SCOTT Fischer, the leader of Adventure Consultants was ROB Hall, both died on the mountain that May. You read “an article” and saw “a movie” and you feel capable of offering an opinion? How about you read several whole BOOKS and try and get a more intensive perspective on what actually happened that May. Its shocking how lazy some of you college kids are,, tv and movie and magazine articles,, can any of you read? Armchair quarterbacks. I suggest you read Anatolis Boukreevs book The Climb to supplement your movie review. Yes,Pam! How i glad to meet a soulmate here! I think Boukreevs book can tell us the truth without blaming and judjing. Naked truth about peoples nature,about mean,about brave. Hi, thanks for a really good review of the disaster. I would really recommend anyone to read Anatoli Boukreevs account aswell as into thin air. Both very good books giving different perspectives. Thanks again. I could not get a copy of Boukreev’s book for rent. I will have to surf the internet and buy one. Will do that. Joshi,did you read the Boukreev’s book finally? What can you say about than events now? Hi Marina, I recently visited Nepal and trekked to Annapurna base camp. I saw Boukreev’s memorial there, the mountain which killed him. I have purchased his book, The climb, but I’m yet to start reading as I’m busy with my own book writing. Very comprehensive post, and thank you! I’m just now delving into the Everest story – and somehow I’m falling down the rabbit hole into other expedition disasters as well (I blame this list, which does include Everest btw and Franklin, which is another one I’m obsessing over: http://www.ranker.com/list/10-of-the-most-doomed-expeditions-in-history/analise.dubner). Your account of Everest is fantastic and I am now getting ‘Into Thin Air’ to read ASAP. Do you write about other “doomed” expeditions? Just wondering, because I thoroughly enjoyed this one. Keep writing! You have a new fan. Thanks Lari. I’m thinking about writing something about Annapurna and K2. Joshi,, I enjoyed your blog , I thought it was concise and at least you wisely drew little conclusions or judgements. Yogeshwar’s perspective of the incident may not be right, but I just want to forgive him. I haven’t read The Climb. I couldn’t get a copy of the book. I will try to get one. And, thanks for the complement. Do read my other posts as well. Tremoundous amount of courage for such endeavor, all should be applauded. I am just now reading Jon Krakauer’s book and went online to read more. Your report was very good! Thank-you. I have been to India and have only seen the mountains from the air. Such a wonder! thanks for reading this post. Those mountains must be wonderful, but I haven’t seem them!! There was a lot of coverage in newspapers regarding Traffic on Everest in 2012.Reading those articles and clicking subsequent links I landed on 1996 disaster.Like you , i too became curious about the things and came across lots of articles on internet and then I stumbled upon your blog. Very well written summary connecting all the groups on the Everest on that day. Thanks Jayanti. Glad you read the article. Thanks for the summary of this horrible event, i got amazed about how some people could risk their lives to save others and in the same tragedy others could do nothing… Afriend of mine told me this history in a little book shop in canada when he found a copy of “The Climb”, and told me about the different, let me say, “perspectives”, i think that nobody never would know the all true. 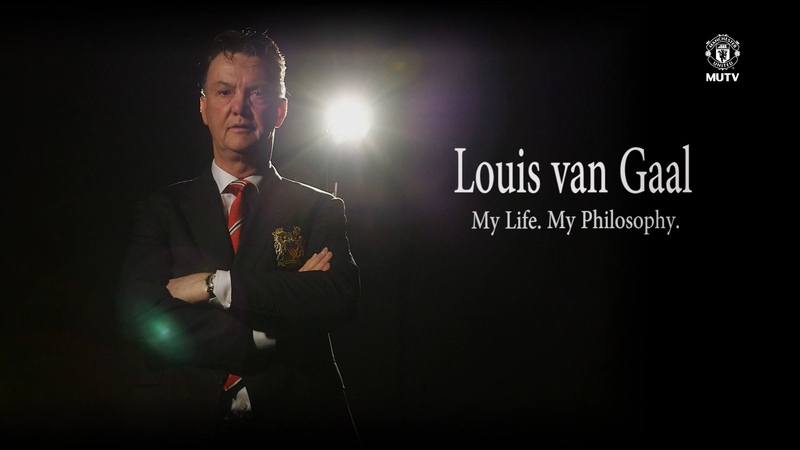 Thanks again for the history and sorry for my english. Hello Matias, I’m glad you read this article. “The Climb” is a good book and read Jon Krakauer’s “Into Thin Air”, if you haven’t already. Like you said nobody would come come to know the real story!! Very well written. I too appreciate your ability to clarify the locations of the people during the expeditions. It was difficult to follow. I read John Krakauer’s amazing book several years ago, and read many other briefer accounts of this tragedy; this was a beautifully written summary. I don’t know if you are checking this site anymore, but if so I would love your opinion about something that has bothered me. The Sherpas are so beloved that it seems to me that no one wants to say anything negative about them. I have always thought the two hours that were lost by not having the ropes in place when they were needed was the single most important factor in this disaster occurring. It was the Sherpas responsibility to lay the rope, and no one wants to point out that this tragic mistake was made by the Sherpas. And even worse, the ropes didn’t get laid because the Sherpas were angry with each other, or one was angry at the other!! As beloved as they are, this should be acknowledged and discussed so that nothing like that ever happens again. Even Krakauer is loathe to point it out, even after laying out the fact that he encountered one of the Sherpas (apparently angry that the other Sherpa wasn’t there to help) just sitting when the rope should have been being laid. Krakauer offered to help since he couldn’t go any higher and just sitting and waiting is very dangerous. I do realize that there were many other contributing factors—the other most significant factor was ignoring the turn-around time, which is usually adhered to religiously!! You named a lot of the others, but many of them would not have occurred if they had been headed down 2 hours earlier. Thoughts? I actually failed to notice that the Sherpas are also to be blamed but I don’t know how or why the book writers happened to ignore the Sherpas’ part in the disaster. I would like to give you more thoughts on your points (which looks well researched) but I wrote this article quite a long time ago and I have forgotten most of the details of the incident. I do think ‘that’ 2 hours perhaps was the most important factor in the incident. Horrible Incident? Yes, of course. Thanks for the summary of the tragic and intriguing 1996 Everest expedition. I had read Krakauer’s account when his book was published, and have since been attracted to any stories of high altitude climbs. I happened upon your blog after reading, in the April 2012 issue of National Geographic, a wonderful account of the successful summiting of K2 from the Chinese side in 2011. The article featured Gerlinde Kaltenbrunner, a 40-year-old Austrian climber who became the first woman to summit all 14 of the world’s peaks exceeding 8,00 meters, without oxygen. I’m glad you have received some good feedback from your article and will be interested to follow your blog. I’m glad you read this article and enjoyed it. 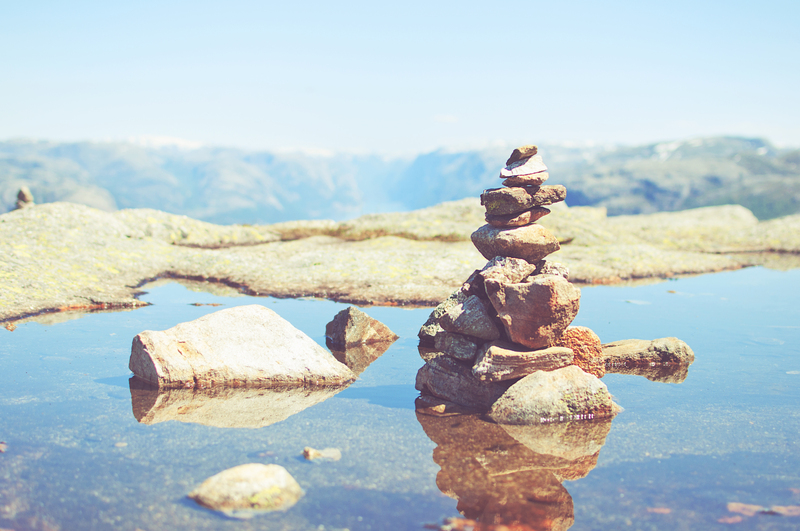 This post was inspired by Krakauer’s book. I have read anything about Gerlinde Kaltenbrunner – will google it. Thanks for following my blog, but I’m more of a humor blogger. Hope you would still enjoy reading stories from my personal experiences. sure will try your blog – definitely need to laugh. thanks for your reply! Great write up – many thanks for that. I’m also very interested after reading Into Thin Air, and now The Climb. You may also be interested in watching a couple of DVDs I viewed recently about more events that happened that month on 1996. One is Miracle On Everest about the amazing survival of Lincoln Hall who was pronounced dead and left near the summit. The other is Dying For Everest about a double amputee who summited that month and the publicly perceived neglect and subsequent death of David Sharp (near Green Boots cave) that caused a massive controversy. Both good shows that go a lot to convey the utter deadliness of Everest. Thanks a lot, LIZ, for suggesting those DVDs. I will watch them soon. And, Thanks for reading this post. This achievement of reaching the highest point on earth is much less glorious and more foolish than anyone thinks. The will to summit is greater than the will to survive. Read a day to die for 1996 everests worst disaster. into Thin Air is a rubbish and totally biased account. In part I suspect to excuse Krakuers own failure to do anything to help the others on his team. Its wrong to castigate Anatoli who did so much whilst Krakaur was sleeping. In defense of Krakuer, I would say, since he’s not an expert climber like Anatoli, he probably wasn’t in a condition to help others. So he shouldnt blame and judge Anatoli. Why is he judje him but not Rob? Who was responsible for his team and who made a lot of mistakes!? With queues of waiting to climb. I take my hat of to those who continue in mountineering pusuits and wish them well. Yes, Everest is attracting more and more crowd. Everybody knows the risk involved, but still want to do it. Really, a nice and informative post.Here I have to say…That mountaineering should be only taken for the fun but with caution.It cannot be appreciated ,if it takes lives from lovely families,societies and countries. No Karthik I didn’t follow up on them. I didn’t know Green Boots was removed. Thanks for the update. I don’t think anybody climbs Everest for their country. It’s always for personal glory and, no it’s certainly not worth dying for. It seems that the financial cost of the trip to the top of the world ( to many they will never be able to try again) .. coupled with the summit fever once you are getting so close–( we are almost there, we can’t stop now ) and let’s not forget the lack of oxygen to your brain all add up to climbers making one bad decision after another …..and the sum total is death. Can anybody give me cracked XEvil program?